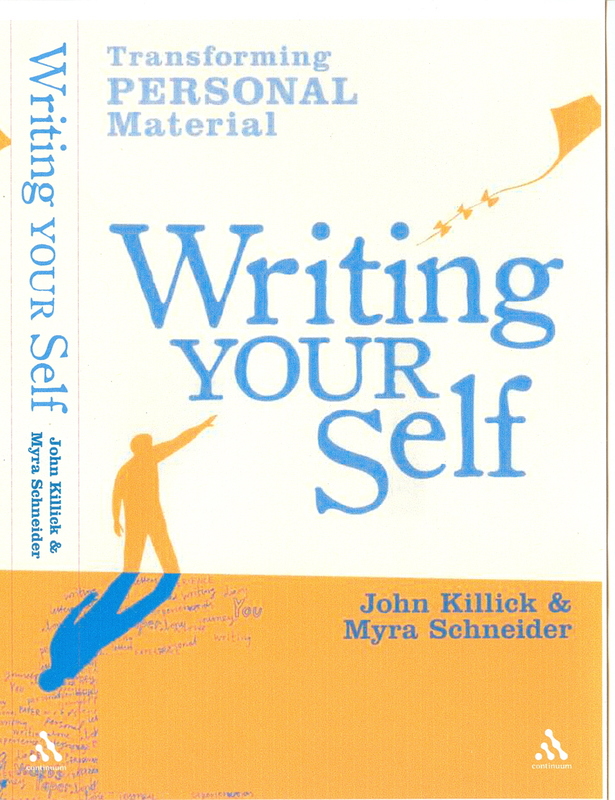 Writing Your Self, which which I wrote with John Killick, was published by Continuum International in November 2009. There has been a very enthusiastic response to this resource book. We are excited about this resource book of personal writing and literature. It is intended for people who would like to explore themselves in writing, for experienced writers who wish to develop their work in this area and students taking life writing courses. It will also be of great interest to writing tutors. In Part One we examine how many authors - well and little-known - use personal subject matter in memoirs, poems, journals and novels. We look at universal experiences including childhood, identity, adult relationships and loss as well as more specific issues such as displacement and disability, physical and mental illness and abuse. Key to the book are frank, firsthand accounts by ourselves and other writers which show in detail how we tackled writing about our personal experiences. Part Two offers a wide range of techniques for approaching personal material together with practical exercises and examples. It also considers the differences between raw and finished writing and the validity of each. The final chapters offer ideas for developing work. The book costs £16.99 and is available from good bookshops, also from the Continuum website, Amazon and other online bookstores. We are very grateful to the many people who have generously contributed poems, prose and examples to the book and also to those who have written in-depth essays. For further information please contact me or John. Below the cover images are reviews and extracts from reviews of the book followed by some informal comments. This fascinating book is offered both as a resource for would-be writers or a potent therapeutic tool to self-healing and the authors suggest it can be used either thematically, read consecutively or dipped into randomly. Whichever way it is used we are invited to open the sealed doors we all have locked away inside us, inspect the hidden contents revealed, write about what we find and expect surprises. I read it in one sitting on a six hour train journey from Scotland to London and as I rattled past the changing countryside I couldn’t help speculating what unlikely revelations might have been disclosed by Frances Cornford’s "Fat white woman whom nobody loves" if, on returning from her famous walk through the fields, she had ripped off her gloves, taken up her pen and braved a voyage of self-discovery! We are none of us quite what we seem, even to ourselves. Apart from their own interesting and insightful comments, what most impressed me about this book was the extraordinarily high quality of the examples of poetry and prose, some by novice writers, some by professionals, which the authors – both creative writing tutors as well acclaimed poets themselves – have collected to illustrate the various exercises they suggest the reader tries: all of these examples were interesting, most were encouraging for the nervous amateur; many were inspirational. This is certainly not just a book for a single reading, but one to keep permanently available on your shelves and take down many times when fresh ideas and inspiration are needed. Highly recommended. Part I: Here the focus is on life experiences, the exploration of those human experiences that are universal. These include childhood, self-conceptions, relationships, displacement, physical and mental illness and disability, and abuse. Part II: Here the focus is on writing techniques, recognizing material that is unfinished, working on refinements, and developing work projects. Writing Your Self is rich with examples from known and unknown writers including the authors. By example as well as explanation the authors reinforce what we all intuitively understand to be true: that telling stories preserves identity and clarifies the human condition. It helps us understand what it means to be human. The experience of working through the book was something like a rite of passage. I have worked as a writer in healthcare for many years now, getting people to tell their personal stories, to re-member themselves when they are lost in the wilds of institutions or illness, or to discover the gentlest of dream landscapes that can hold them safely when their lives are in pieces. We all live with an everyday formulation of language but to find new ways to use words can be potentially very healing and lead to the creation of art that speaks directly to many people, sharing experience as wisdom and sometimes beauty. 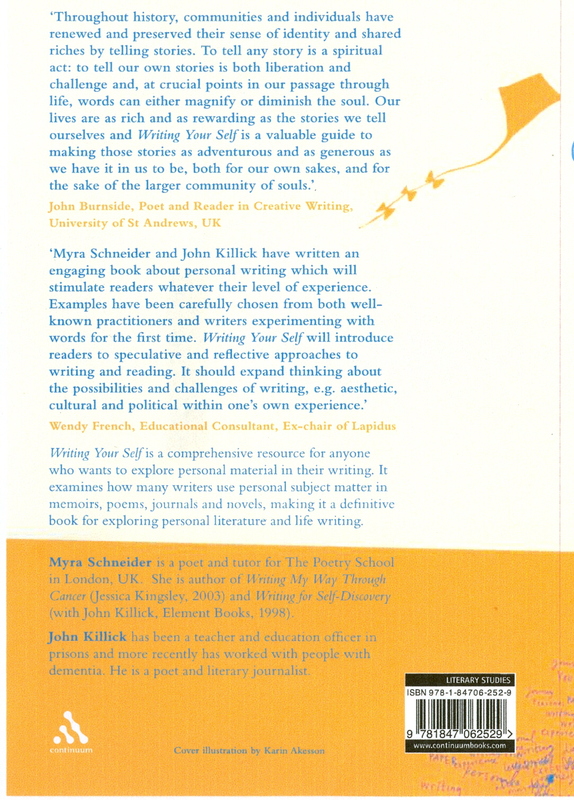 John Killick and Myra Schneider's fine new book 'Writing Your Self,' takes an in-depth look at how writers themselves chose to use the material of their own lives to make art, to communicate their own self-knowledge and transform experience through words. Both the authors also contribute their own stories with characteristic generosity…. The writers here, are often nakedly clear, not just about what happened to them and how they felt, but the tricks they played with themselves to avoid confrontation, the methods they used to find control, the time it took - the years. It makes compelling, sometimes overwhelming reading and consistently offers insights into the writer's craft. So much courage is here. And the responsibility to state how life is - messy, terrifying, full of death perhaps - but also transcendent. Miriam Hastings says: "I do think its important to stress that creative writing can be beneficial and healing even when it isn't directly autobiographical. The very act of creation is therapeutic…taking the raw material of real life and shaping it into something different and powerful is a magical transformative process. In my personal experience I've found it can not only transform our writing, it can also transform our lives and selves." From two respected authors and personal tutors comes a comprehensive resource bringing fresh ideas and inspirational practical advice on how to set about unlocking, working with and transforming personal material. Writing Your Self is formed of two parts. The first comprises 11 chapters arranged as a general progression through life experience…The authors candidly offer from their own experience and are joined by other contributors (including Penelope Shuttle and Pascale Petit) who also give first-hand accounts of how they set about tackling their own subject matter. Writing Your Self is dynamic and participatory. It engages and stimulates in its discussion and treatment of subjective experience and is a book designed to inspire and expand writers' thoughts in ways both subtle and challenging. Focussed on encouraging self-discovery through to the different forms of expression this might ultimately take (memoirs, poems, journals, stories or eventual novels), it's a valuable and rewarding resource, sensitive as it is thorough in the nurture of evolutionary personal work. I would like to say what an amazing resource Writing Your Self is – so rich, so varied, so well researched and referenced. The examples are powerful and well chosen. The book as a whole is authoritative, compassionate and utterly convincing . New writers (and not-so-new writers) will have a sense of being taken by the hand and guided by wise friends. I now need to pass it on to the staff who teach poetry and life writing, so they can get it on their book lists and into our library. I hope it does very, very well. It seems to me one of those rare books with an almost unimaginable shelf life and world wide relevance. May it flourish! My students love your book! ‘…my copy of Writing Your Self arrived safely, and it is a beautiful inspirational grounded and immensely useful book. I am still finding new and moving and true things in it..
'Writing Your Self' is excellent. I found it clear and easy to follow and the frequent use of examples of pieces of work both aided understanding and added interest. This is a wonderful source book for any writer who wants to draw on personal material and I'll certainly recommend it to all my students. Bravo to you and to John Killick for this achievement!